Finally, you can experience the thrill of driving a bus from Tucson, Arizona to Las Vegas, Nevada in real-time. 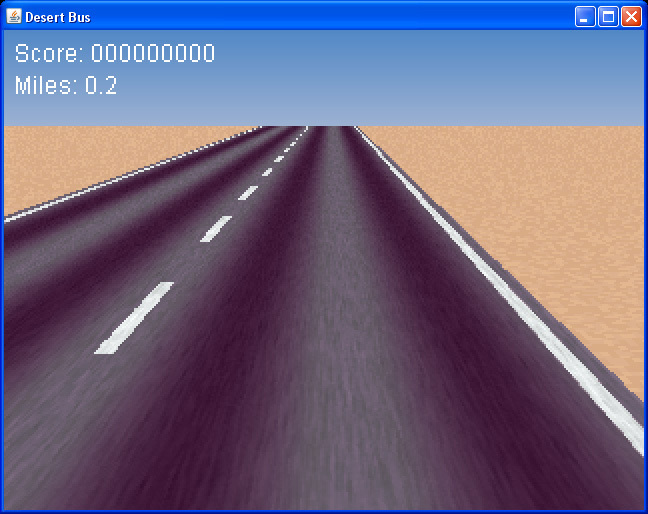 Inspired by the unreleased Sega CD videogame, this is Desert Bus. Desert Bus is designed for people who do not like violence in their games, for those of us who prefer more realistic gaming scenarios. Be prepared to fight driver fatigue as the highway seems endlessly long, smooth and monotonous. Score 1 point for every 8 hours of driving. The bus veers to the right, just ever so slightly, to keep the player active at all times. Learn more about the original Desert Bus here.